I don't know about you, but I'm a gal who loves gadgets! 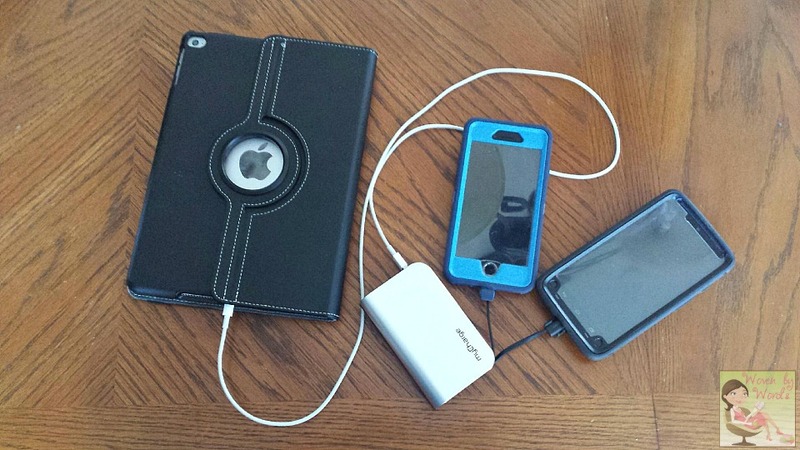 I love gadgets that make my life easier & are helpful. I love them even more when they're a gift for Valentine's Day. 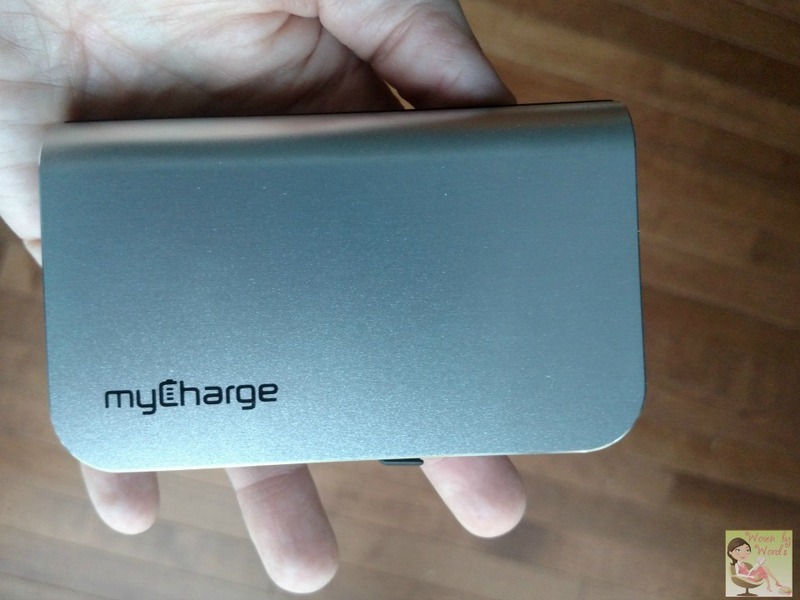 A few weeks ago, I got an email telling me about a charger that I'd never heard of before, myCharge! I have a back up charger that's super tiny and bought almost 5 yrs ago. It was time for an upgrade! I asked them if I could review it and give one away. When they agreed, I was ecstatic! Here's what I find amusing. 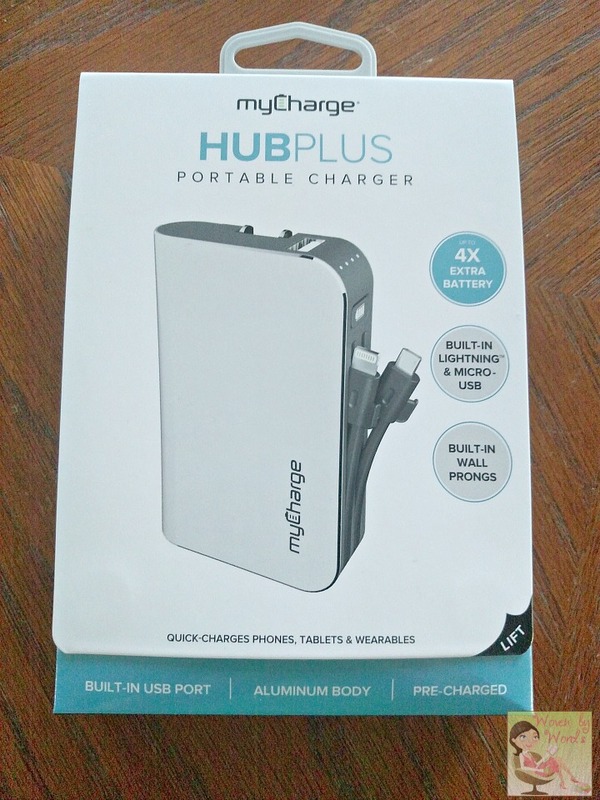 Less than a week later I had to go on a business trip and was so bummed I hadn't gotten the email about the HubPlus Portable Charger a week earlier. Anyhow, I'm sitting in the airport waiting for my flight when I sit next to a gal who's charging her phone. I glance at her charger...it's a myCharge! Since I hadn't seen one in person yet, I asked her if she liked it, and if I could take a look at it. She liked it a lot, and started fiddling around with it. That little techy gadget was a great size! When mine finally arrived, I was ready for it. See, my phone is over 2 yrs old. The battery now leaves a lot to be desired. Unfortunately, I work in social media, I'm a blogger, and well, my phone is never too far from me. When I go out, I need a back up charger. When Fred and I go on day trips, they can turn into being gone into the evening. My phone's battery won't make it that long without a recharge any more. I've had it for a week and a half and it's come in handy numerous times already. The first time was on Monday when I took my son to school. I had to drop him off and go sit at a restaurant for nearly an hour. I hadn't had a chance to charge my phone, and I needed it to have some life to it while I was at the gym. So...I actually killed two birds with one stone. I plugged the charger in because I hadn't had a chance to charge it all the way because I'd used it here and there over the first week. 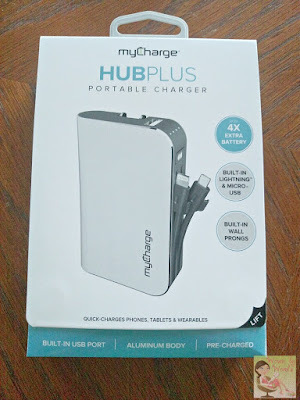 While it was charging, I had the HubPlus plugged into my phone so it could charge. Two birds with one stone! And as you can see, it can do three items at once if needed. Go to a conference, it could definitely be needed! Now, the only two things that I could suggest for this is to make the cables longer. I tend to move around with my phone, so if the charger is attached to it, I like it to easily bend it around to the back and hold them together. I can do that if I'm just holding it in my hand, but if I'm holding the phone on my shoulder (I like to multitask) the charger tends to slip out. The other piece that I would change is making the battery lights stay on while I'm charging a device. I like being able to glance at it and know how much juice I have left. That being said, it's a personal preference. Others probably like the fact that you can just push a button to see how much charge is left instead of having the lights on constantly. Not a biggie, just something I like. What I do know about my new myCharge is that it's going to get a lot of use with me around, and if you ever see me out an about, ask me if I have it with me. I can guarantee you I will. I'll even let you borrow it! That looks so cool. It would make a great gift for my boss. His phone is constantly low! I would love to get the Razor Plus for my hubby! Thanks for the chance at this great giveaway! The Hub Max would be great!! ok... this looks pretty cool. I love chargers I can throw in my purse. I like the Style Power Watercolor. The All Terrain+ would work well for me. I like the razon mini. I also really like the HubMini. 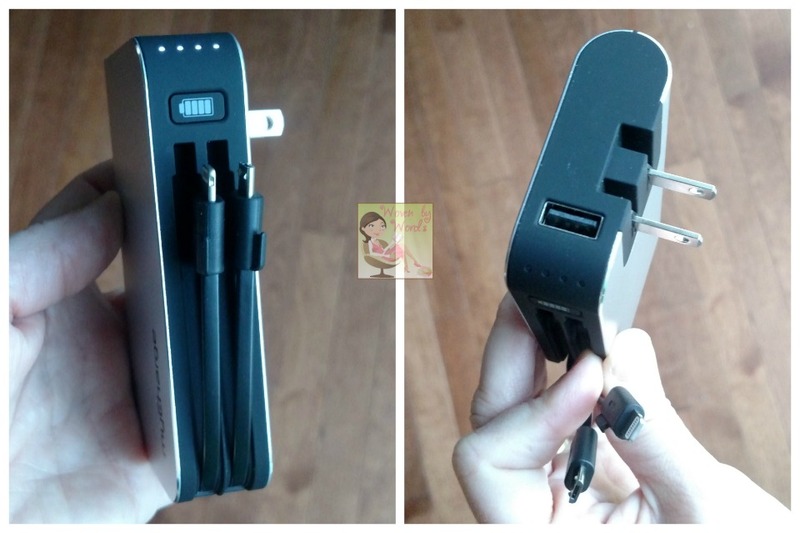 It would be great for travel and I like that even though it is small you can still charge 2 devices at once. I also really love the Style Power Watercolor! The Hub Max would be great for me. The HubMax would work well with us. I really like the All terrain series. The HubMax would help my son while he is doing his deliveries. I really like the razor extra! It has 2 USB ports. The myCharge RazorUltra 12000mAh portable battery charger is just what I need to charge my devices whole at work or on the go. The HubMax would be best for me. I would also love the RazorUltra. Would love to try it out..
Hubmax would get me through the week. I could definitely use the Razor Ultra, it is exactly what I need! Thanks so very much for the chance! I like the Style Power Teal. The AmpProng+ would also be great for me! The RazorPlatinum would also be great to have. I like the HubMax as well. You can never have enough portable battery no matter what the cell phone manufacturer says! RazorMini looks good to me! I the the Style Power!